Letterpress printers get to work with some of the most luxurious, gorgeous paper on earth, but what’s a printer to do with all the extra paper that piles up after a job is finished? We asked letterpress printers from all over the country about the unique ways they’re giving new life to paper scraps, discontinued products, printing goofs and excess inventory, and we’re feeling particularly inspired by the answers! 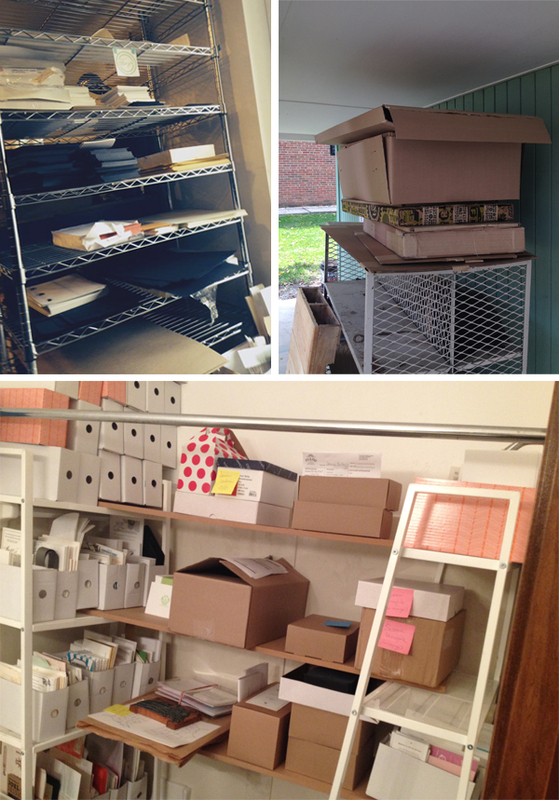 Here at Boxcar Press (also home to Smock and Bella Figura), we move excess paper and product in a variety of ways. Beyond our regular green printing efforts (we have a weekly pickup from the Empire Recycling Company and we reuse paper scraps in the office for notes), we have a few events to move out excess product and sell items that would otherwise just gather dust. We started hosting a Sidewalk Sale to sell slightly imperfect cards, notebooks, gift wrap, boxes, and more at extremely low prices. 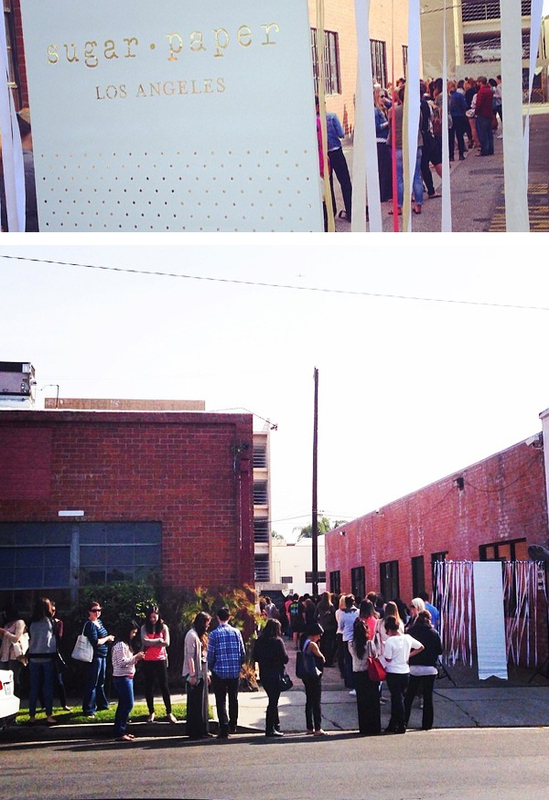 Partnering with local food trucks has been a great way to boost attendance and make the event really fun! 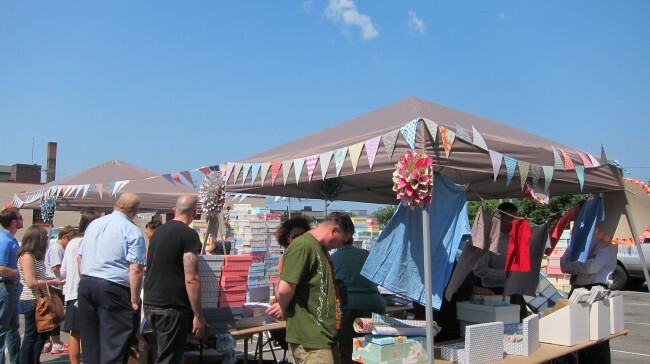 If you’re near the Syracuse area, our 2014 Sidewalk Sale will take place on Wednesday, August 13 and Thursday, August 14 from 11am-5:30pm. In addition to the Sidewalk Sale, we also invite teachers from the Syracuse City School District to come in and stock up on papers for their classroom projects during our annual paper giveaway in October. We save excess envelope liners, paper scraps, and envelopes throughout the year, and the teachers stock up and put these offcuts to good use. Igloo Letterpress of Worthington, Ohio — We are part of a few neighborhood Facebook “freecycle” groups and every time we have a stack of extra cardboard, paper scraps, or even unused furniture or supplies, we post a picture on Facebook and let people know they can come grab what they like from a shelf on the porch. We are very connected to a few elementary schools and the local preschool in the neighborhood, so we often bundle up boxes of usable scraps and pass them on. There are also some great arts companies, guilds and groups in Columbus that call us every once in a while to see what we might have – we are never short on paper to give away! With our seconds, we organize them into our bathroom-turned-sample-room and are generous in giving them to future clients. We love being able to send clients home with a stack of beautiful letterpress items to remember us by. For discontinued items and styles, we clearance them in our retail shop, and gift them to lucky customers as a bonus for a sale on other items. It’s always nice being able to use a few extras to smooth over a rough transaction, and fun being able to offer a bonus card for a large online order. 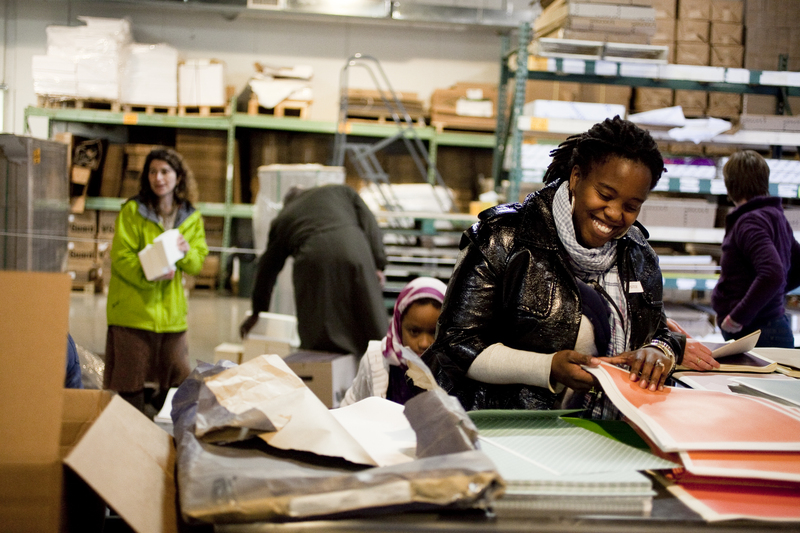 Sugar Paper of Los Angeles, California — At Sugar Paper, we take recycling very seriously. All scraps that result from die cutting or misprints on the letterpress machines are recycled on a weekly basis. We have 2 bins in the pressroom dedicated to recycling. Any extra inventory or discontinued items are all part of our sample sale that occurs in the spring right here at our Los Angeles studio (and they are sold with crazy low discounts!) If we have paper that we haven’t used and will no longer need for any of our products (think extra envelopes or discontinued paper stock), we post the news of extras on our social media channels and give local schools and programs a chance to come pick them up. 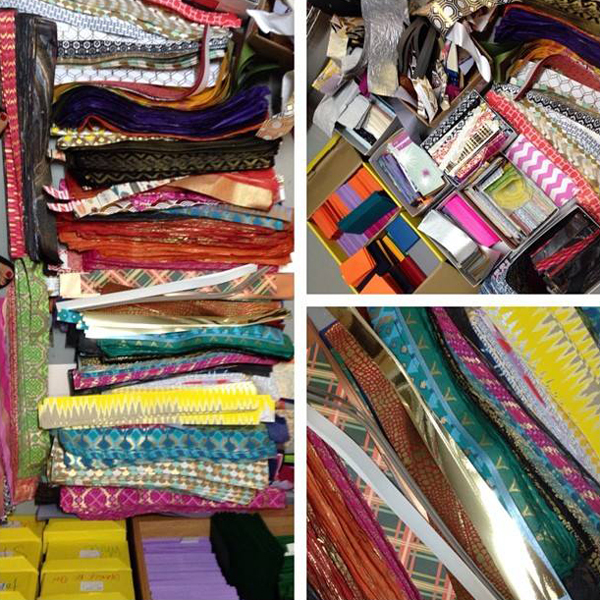 The photos below are from our sample sale last spring. Jenni Undis of Lunalux in Minneapolis, Minnesota — I am thrifty and resourceful by nature, so we reuse as much as we can at Lunalux. We’re lucky to have a retail boutique and a letterpress studio in the same space – we can re-purpose even the smallest scraps and off-cuts, and sell them directly to the paper-obsessed people who will appreciate them the most. If we end up with extra stock from a custom project, or big-ish scrap, we print whatever suits our fancy and turn it into a little product on the shoppe. 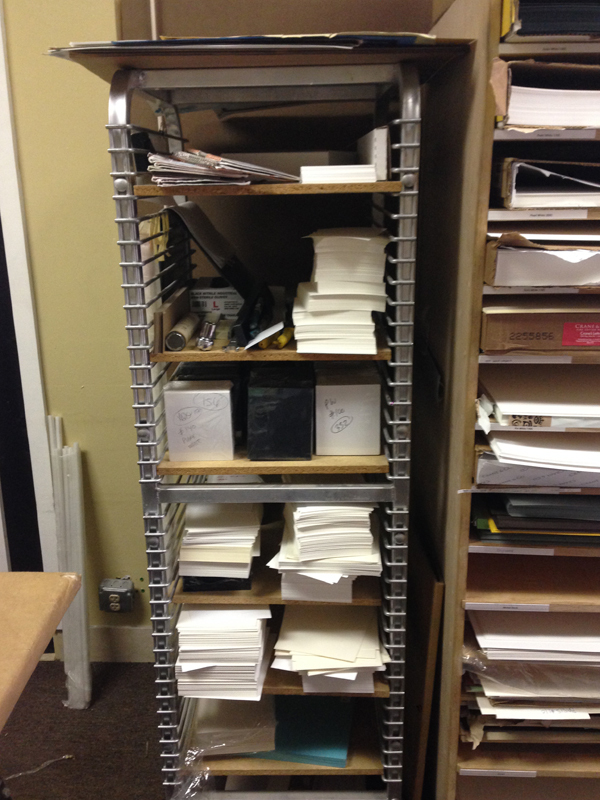 The shelves here are full of small-run notecards, notepads, bookmarks, and tags. Odd bits of blank paper are bundled with bakers twine and sold for a dollar (perfect for DIY gift tags, place cards, etc.) Make-ready, mis-print and over-print posters are reincarnated as notebook covers. We’ll even trim the decorative elements off old invitation samples and pair them with tiny envelopes – fancy, limited-edition gift cards! If it ends up in the recycle bin, it’s pretty dirty, small, non-descript, or otherwise useless. We recently had a “Paper by the Ounce” sale. We pulled out boxes and boxes of discontinued wholesale products and sold them for $1 per ounce. People bought pounds. A nice way for us to send useful, cute stuff out into the world and make room on our shelves. 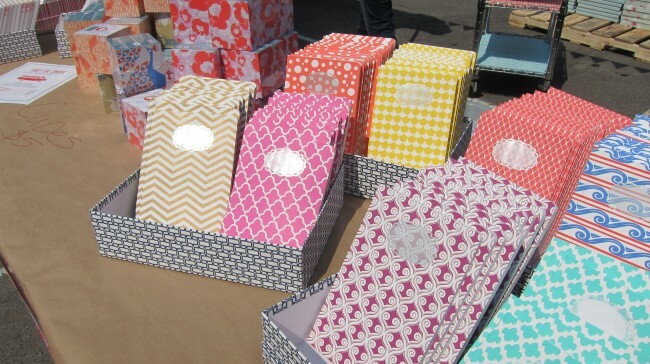 Haute Papier in Arlington, Virginia — Scraps take on a whole new life once they become the skinny strips that are left after we cut our papers down for liners. We use the “bands” as we call them to wrap our boxes of stationery before they ship out to our stores. And because we have WAY more strips than we could ever use, we also donate them to elementary schools for their art programs. Since we never make mistakes, we don’t have seconds…. just kidding. We often use these in house for writing notes to our stores and sending little treats along with our orders. For discontinued items, we sell by the bundle, give to schools, and try an inventive sale idea. Smudge Ink in Charlestown, Massachusetts — We schedule paper giveaways for local teachers, art instructors and community leaders. They come for a 3 hour period and clear out our excess paper and envelopes. This is usually posted on social media. 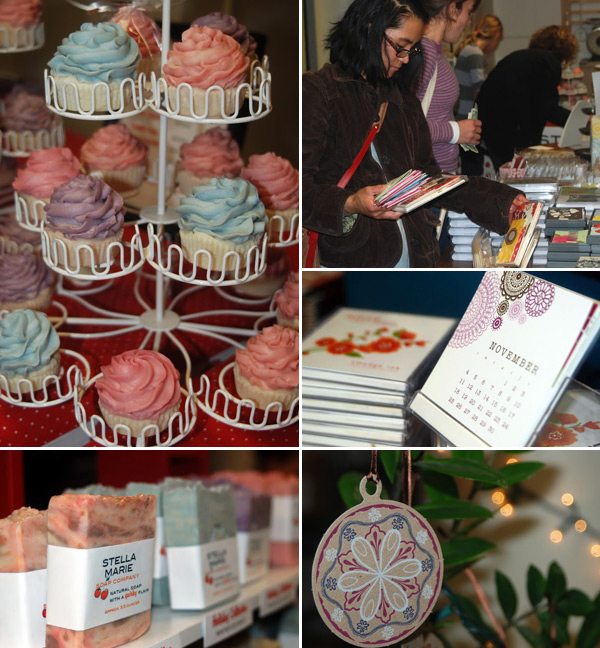 We also have a yearly holiday Sip and Shop and have a few bargains for people in addition to our new products. Some of the proceeds from that event go to the Greater Boston Food Bank, so we have the satisfaction of helping, too. Matthew McNary of Hammerpress in Kansas City, Missouri — We recycle the majority of our paper scraps on a weekly basis. Occasionally, our folks get creative inspiration and repurpose the scraps for interesting things (like dog jewelry) or personal projects. If the scraps aren’t too small (and are somewhat uniform in size), we’ll store them and reuse them for projects that fit smaller press sheet sizes (like business cards or hang tags) or for our own small printed materials. For example, our last run of business cards were printed from scraps of a postcard project. 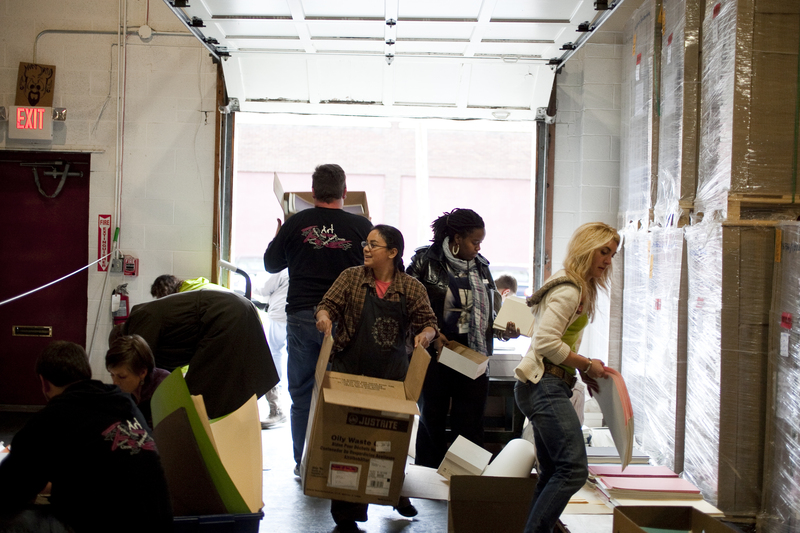 Twice a year, we gather all our misprints, make-readies and discontinued product for a big sale. All cards go for $1 and larger sheets sell for $3-$7. It’s proven to be a great way to offer some great deals to our customers while giving us the opportunity to open up some storage space and generate a little revenue from paper that would otherwise be gathering dust or taking up space in a landfill somewhere. Joey Bordega of Mama’s Sauce in Orlando, Florida — We do lots of recycling. In fact, we’ve got a 4 yard dumpster specifically for recycling that gets picked up weekly. All of our excess, unusable paper goes in there. Sometimes, a project will leave a usable amount of paper left behind. If it’s one of our house stocks, we trim it down to one of our commonly used sheet sizes (maybe 4UP or 16UP business cards) so that it’s ready to go next time we need it. If there’s something left from a more uncommon paper order, we’ll add it to an internal inventory at a highly discounted rate so our consultants can try to use it on an incoming project that could benefit from that paper. On occasion, we’ve given leftover paper to a local school teacher to use for art class. We love paper and try to use every square inch! 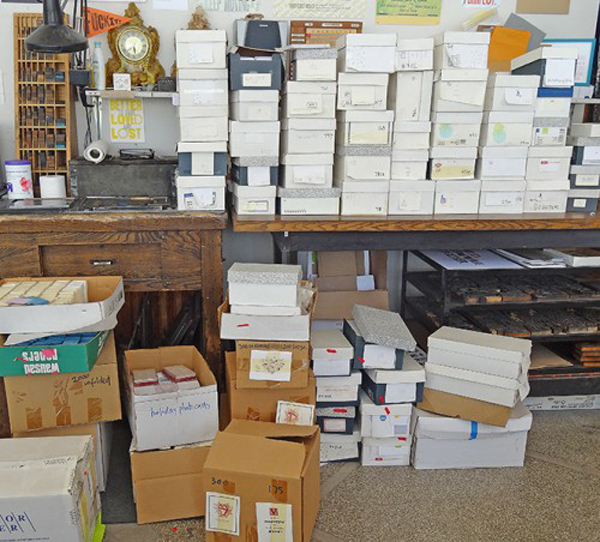 What does your shop do to help move excess paper? Share your tips in the comments section below!